Regular readers of Wildlife Online will know that I spend a good deal of my time in the New Forest, watching and photographing the wildlife and landscapes. This season (autumn) is, hands down, my favourite. Not only do our oak and beech woodlands undergo a spectacular change in colour as the nights draw in, the Nova Foresta is the only forest in England where pannage is practiced to any significant extent. 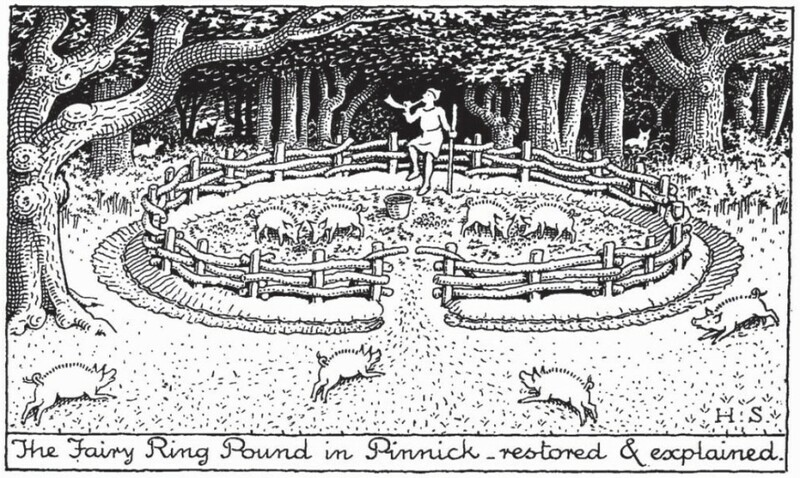 Pannage is the well-known practice of letting pigs out into woodland to eat the acorns that are potentially toxic to ponies and cattle, but this ancient Forest Right didn’t start out with that aim, and has a rich history and tradition of which many are unaware. Mast is the collective noun for the seeds and nuts produced annually by deciduous trees, although the term “a mast year” often refers to years in which greater than normal quantities of nuts/seeds are produced. Indeed, many trees will produce large seed crops cyclically. 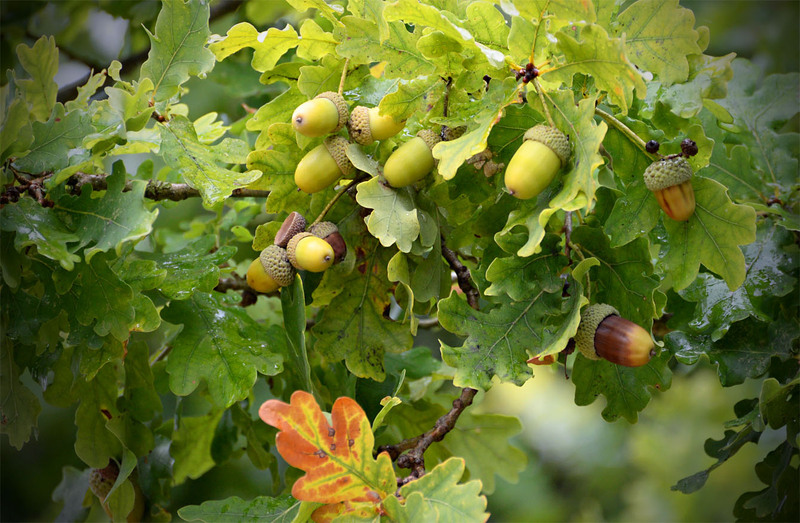 An oak woodland, for example, will produce an acorn crop every year, but will generate a bounty (i.e. have a mast year) about once every seven years. This means oak is a more consistent producer of seed than, say, beech, the seeds of which ripen only during warm summers, producing a usable crop every three years or so. A warm, dry spring and summer, with no late frost to damage the fruiting structures, are generally precursors to mast years. Acorns contain chemicals known as tannins. In particular, there are hydrolyzable tannins that are readily broken down in the stomach to produce tannic acid, pyrogallol and gallic acids (sometimes collectively referred to as gallotoxins), all of which can damage the liver and kidneys. Over-consumption of acorns can result in lesions of the intestinal lining (e.g. ulcers in the mouth, throat and stomach) that reduce nutrient absorption and cause the animal to lose weight. The kidneys can be irreparably damaged trying to filter these gallotoxins from the bloodstream. The toxins may also physically attack the liver, and Gill described how the post mortem of a pony killed by such “oak toxicosis” often reveals a liver that has “degenerated into a pulp”. In addition to physiological damage, tannins also appear to react chemically to reduce nutrient availability and impair biological reactions. The specific toxicological mechanisms aren’t well understood, but we think they and their gallotoxic metabolites bind with proteins, particularly enzymes in the saliva, and cells lining the gut, allowing them to directly interfere with microbial protein complexes. Tannins are also well known to bind with certain metal ions (e.g. iron) to form insoluble complexes, thereby reducing their availability for absorption. Indeed, their role in the acorn relies on this ability. Newly formed acorns are filled with tannins, which bind up the minerals that would otherwise trigger the enzyme activity needed to begin germination. This explains why tannin content diminishes as the acorn matures. When the acorn is on the tree it is initially unripe and green in colour. Green acorns have a high tannin content because the tree doesn’t want them to sprout yet. The acorns turn brown and fall from the tree to the woodland floor where the tannin content continues to decline. Hopefully, a helpful squirrel or jay has buried one of these acorns by the time the tannin content has dropped low enough to release the minerals and trigger germination in the late winter. In a typical year, about half a dozen ponies and one or two cows die from oak toxicosis (cattle seem less susceptible, possibly because they eat smaller quantities than ponies), but mast years can result in significantly greater mortality. In 1968, for example, 80 ponies and 40 cattle were recorded as having died from acorn poisoning, while 27 ponies and five cattle were killed in 2010 and 90 “free-ranging livestock” (mostly ponies, I suspect) died in 2013. Not all species abroad in the New Forest are as susceptible to acorn tannins as ponies and cattle; pigs and deer seem to thrive on them and both can eat significant quantities without any ill effects. (It should be noted that deer are more resistant to tannins, rather than “immune”, as acorn poisoning has been recorded in moose, Alces alces, and fallow deer, Dama dama, following mass consumption of green acorns.) The jury is still out on exactly how pigs and deer manage to utilise acorns, but there appear to be two main elements. Pigs and deer both appear to produce a tannin-binding protein in their saliva, which essentially neutralises the tannins and prevents them either binding with other molecules or being hydrolyzed into gallotoxins. Certainly in pigs, the presence of proline-rich proteins that bind to tannin molecules has been well documented, although the original work by Purdue University biochemist Simon Mole and colleagues in 1990 failed to demonstrate that these “PRPs” had any significant tannin-binding capacity in their subject swine. Subsequent work suggests, however, that they do play a role in reducing tannin activity, and Ikuo Osaka, James Ford Jr., and Walter Hurley found that pigs fed tannic acid exhibited a significant increase in the size of their parotid glands (glands that produce saliva). They didn't study the saliva, but similar studies in rats and mice have shown that parotid hypertrophy is associated with increased production of PRPs into the saliva, which substantially increase tannin binding. By whatever mechanism pigs manage to hoover up the acorns, it was soon realised that they could play an important part in reducing livestock deaths from oak toxicity, and this remains the main reason pigs are turned out onto the New Forest today. Pigs have roamed the woods of Europe since pre-history, with Romans, Saxons and Normans all relying on woodland swine as a source of meat. In her 2013 review, University of Reading agricultural biologist Alexandra Wealleans goes so far as to say that the practice of turning pigs out to fatten up on woodland mast is as old as farming itself and was the mainstay of pork production across Europe for centuries. Indeed, one of the earliest mentions of this practice is in Homer’s Odyssey, in which he tells how the goddess Circe turned Odysseus’ men into pigs, which she fed with acorns. This casual reference suggests it was common practice for pigs to feed on acorns by at least the end of the 8th century BCE. Pannage was practised by early pioneers in the USA, who raised much of their ham on forest mast in the Appalachians, and was also widespread in European woodlands. 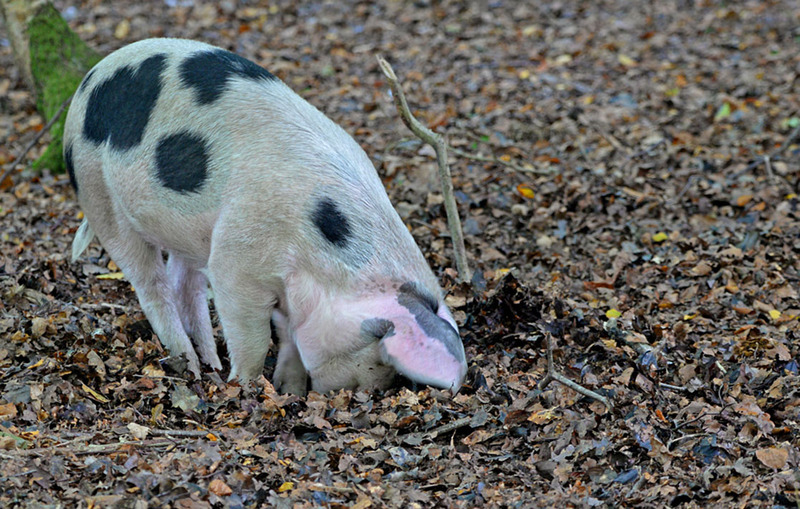 In Meerdaal Forest, central Belgium, for example, there are records of pannage pigs being turned out that date back to 1553, the “Common Right” being awarded to the highest bidder. Pigs were allowed out from autumn until the 1st February, and the Right came with the condition that pigs were herded at all times and fenced at night. This practice seems to have stopped in the Forest by the late 1700s. In Britain, there are texts suggesting that Commoners were guarding their pannage swine with “fierce dogs” on the Weald in southern England during Celtic times, as early as 30 CE, the season apparently running from the end of August until the middle of January. 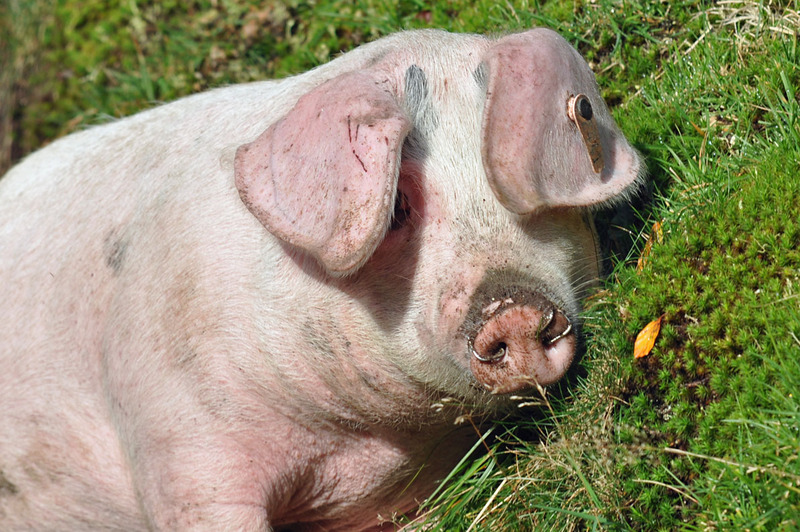 When the Anglo-Saxons arrived, they referred to the practice of turning pigs out for mast as denberis, the plural denbera meaning “a wood for pigs”. 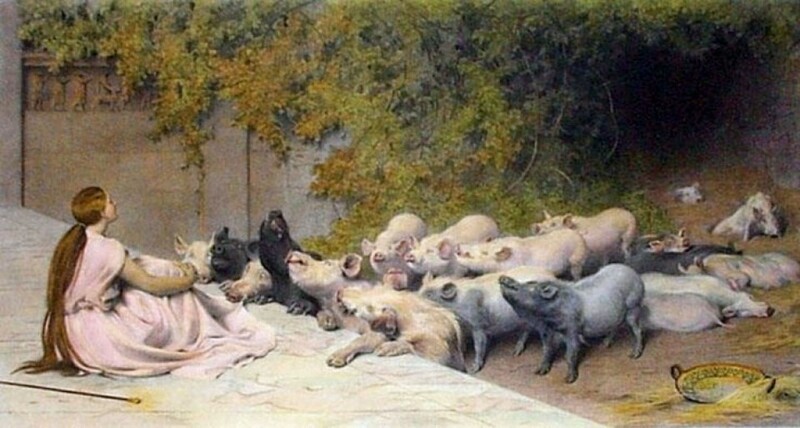 When the Normans conquered England in the 11th century, the practice became known as “pannage”; the word believed to be derived from the old French pasnage, meaning to pay a landlord for the right to feed swine. 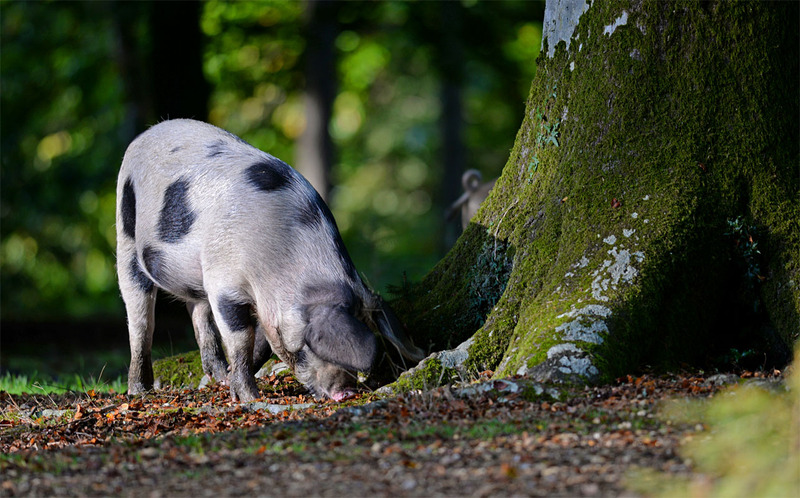 In other words, during the Medieval period, the right to turn swine out onto the forest became known by the name given to the payment made by the commoners, rather than the feeding system itself, as it had been under Anglo-Saxon rule. This remains true today, with denbera having fallen out of use and a pannage fee (in most instances a small amount that’s more ceremony than taxation) still paid, although in some parts of northern Europe the practice is known as eichelmast (literally “acorn fattening”). In many ways, it is thanks to the Normans that we have a pretty good idea of how pannage was implemented in England. Some Common Rights - the collection of firewood is a prime example - were available to everyone and weren’t worth the time and effort to record. Acorns and beech nuts, however, remained the property of the land owner, and consequently there are many legislative and financial records covering what amounted to their sale to Commoners. In the Domesday Book of 1086, for example, pannage was listed as de herbagio, suggesting it was of economic importance to Commoners. Indeed, woods were carefully surveyed and often categorised according to the number of swine they could support – “one-hog groves”, “ten-hog woodlands”, “hundred-hog woods”, etc. Certainly, during the Medieval period, pannage was seen as a quick method of fattening up pigs for slaughter, and reasonable returns could be made from relatively small outlays. According to the National Archives currency calculator, £20 in 1880 was equivalent to about £1,300 today. Here in the New Forest, pannage is officially known as the Common of Mast in the Atlas of Forest Rights and is one of six Rights tied to Commoner properties on the Forest’s Crown Lands. 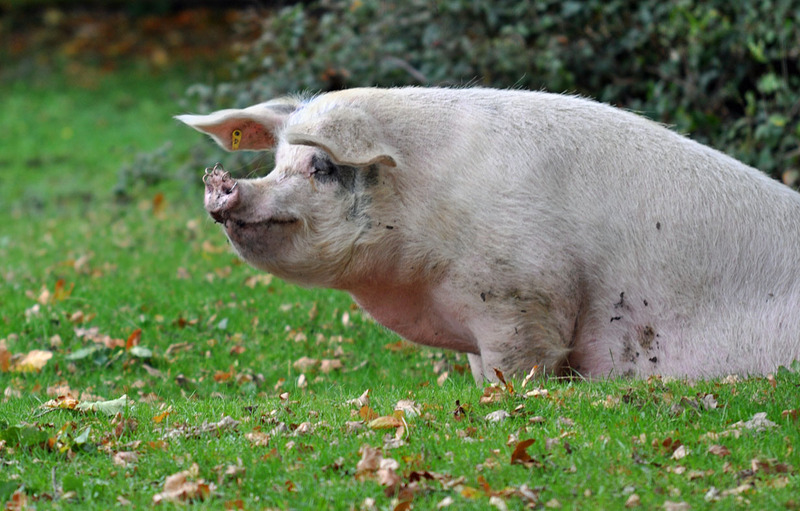 The period for which pigs are allowed out is initially 60 days, typically from mid-September until mid-November, but this is at the discretion of the Forest authorities (i.e. the Verderers and, ultimately, the Deputy Surveyor, who has the final say), and the precise start and end dates vary according to the weather, when the acorns fall, the size of the mast crop, and the number of pigs turned out. If the acorn crop is large and/or too few pigs have been turned out, the Commoners may request an extension to the season. Indeed, the mast year of 2013 saw pannage extended by six weeks, finishing on 13th December. The duration of pannage hasn’t always been at the discretion of the Forest authorities. 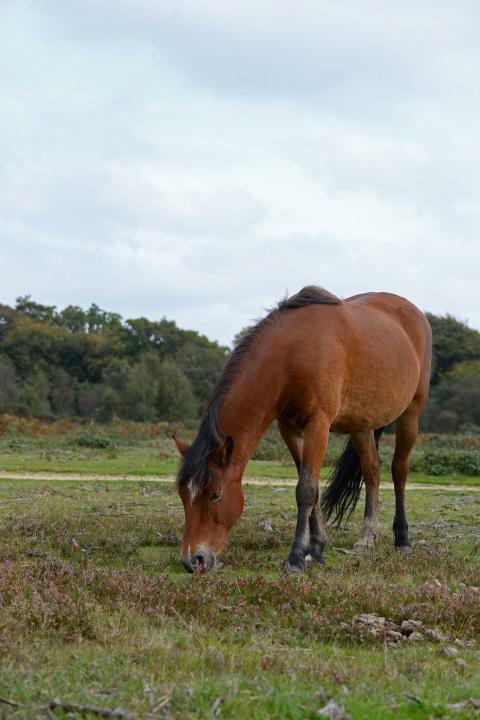 Prior to the passing of the New Forest Act in 1964, pannage was set between 25th September and 22nd November. Section 7 of this Act stipulated, however, that the season must be no fewer than 60 consecutive days, but the dates could be fixed by the Deputy Surveyor, following consultation with the Forestry Commissioners and the Verderers. This flexibility was required primarily to accommodate variation in the mast fall across years, although if the acorns fell late, the pigs apparently started to invade gardens, and some authors suggest this was also a consideration. Paragraph 7 of the New Forest Byelaws (2010, No. 993) states that pigs must be inspected and marked, usually with a small ear tag, by an Agister, and payment (£4/€4.5 per pig) made at least 14 days before they can be turned out on the Forest. Rings are also inserted into the snout to reduce the rooting damage. These days, the Forestry Commission rangers keep an eye on the pigs while they’re out and work with the Agisters in the event of a problem, but historically the pigs were managed by a person known as a “swineherd”. Writing in 1791, former Vicar of Boldre William Gilpin gave a wonderful description of the swineherd’s job. Gilpin also observed that the pigs often split into small social groups for their daily excursions. They ranged the Forest in these friendly groups, returning at night in different parties, some earlier and some later according to how fortunate they’ve been foraging during the day. As it happens, pigs that are turned out from a holding mostly return there throughout the course of pannage, and it’s rare for them not to return to their sty at night, so they’re fairly easy to catch when pannage ends. Those of a more adventurous nature can usually be coaxed back by the farmer shaking a bucket of food, and there’s a lovely photo of Commoner Patrick Cook doing just this near Ashurst in Sally Fear’s superb book, Crown Keepers of the New Forest. In other words, the pigs must return to their home farm at night and stay there until the morning. Additionally, they must have nose rings fitted, must not cause a nuisance and must be taken off the Forest once they've given birth. This is not a true Right, but rather a customary practice. The Agricultural Revolution of the early 1700s and the technological changes it brought, coupled with a dramatic increase in the population and a trend towards urban living, resulted in a steep decline in Commoning and with it the turning out of pigs for mast. In fact, zooarchaeological evidence suggests that enclosed pig husbandry began replacing pannage in England as early as the late Medieval period, and the practice was all but discontinued by the end of the 18th century. Despite something of a nostalgic resurgence courtesy of the Victorians, pannage was economically unimportant in England by 1940, although it was still being practiced in the Forest of Dean in Gloucestershire and here in the New Forest, Hampshire. 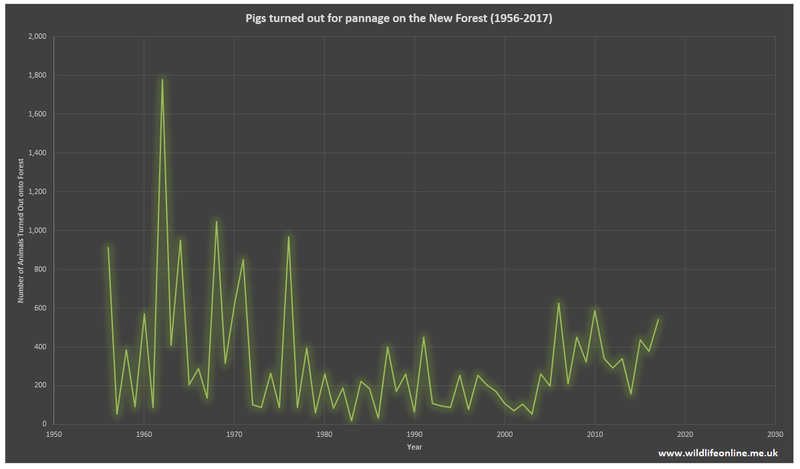 Even in these areas, however, fewer pigs are now turned out than was historically the case, to the point where the take-up of pannage in the Forest of Dean is very limited. Few places hold comprehensive records on the number of pigs turned out, but this data does exist for the New Forest, which is, to my knowledge, the only place in the UK where a significant Common of Mast still occurs. As I’ve mentioned, various factors have historically affected the number of pigs being released (weather, mast crop size, capital available for buying pigs and so forth) and, in more recent times, fluctuation in the market for pork also has an influence; nonetheless, we’ve seen significantly fewer pigs turned out in the last few decades. It was common for several thousand pigs to be turned out every season right up until the end of the 19th century. Some 6,000 animals were recorded to have been released for pannage in 1866, for example, while 1868 and 1890 saw about 4,800 and 3,500 animals turned out, respectively. On average, in the 1960s, 660 were turned out each year, peaking in 1962 with 1,778. In the 1970s, 240 were turned out per year, with a peak of 969, in 1976. The 1980s saw an average of 185 per year, with a peak in 1987 of only 400, while an average of 177 (peak of 450 in 1991) were turned out in the 90s. The 2000s had an average of 240 (peaking with 627 in 2006, following a call from the Forestry Commission that saw an additional 300 pigs turned out) and thus far the average for the 2010s is 383, the peak being the 587 animals released in that first year. Last year 540 pigs were turned out. Since 1960, there have been only two years when more than a thousand pigs have been turned out: 1,778 in 1962 and 1,046 in 1968. While out on the Forest, the pigs, like all free-ranging livestock, are susceptible to traffic, although the fact that they tend to return to their farms overnight probably goes some way to reducing their vulnerability, particularly given their penchant for feeding on roadside verges. 1985 saw the start of the recording of the number of individual livestock involved in traffic accidents on the New Forest as part of the Verderer’s official data set. According to this data set, two or three pigs are killed or injured on Forest roads every year, compared with seven donkeys, 21 cows and 98 ponies. 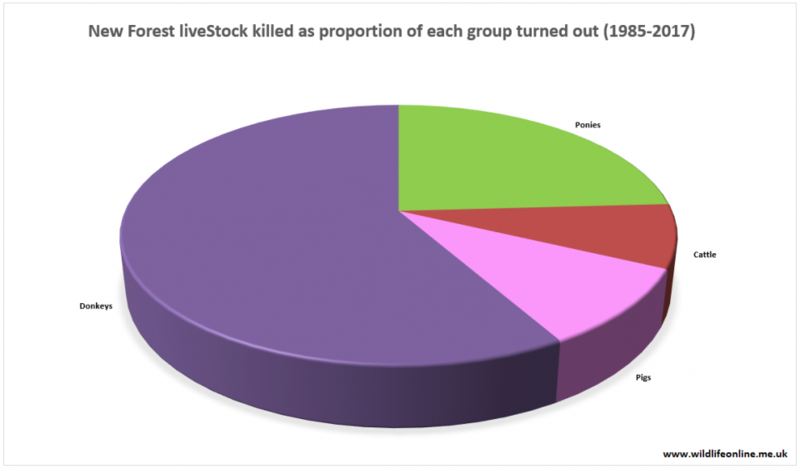 Normalising the data for the number of each type of stock turned out, one pig is hit for every 103 turned out, making up about 10% of all livestock collisions. Donkeys make up the most, with one hit for every 17 turned out (cows 1:126; ponies 1:41). There’s more to turning pigs out into a woodland than just reducing the potential for oak toxicosis in ponies and cattle. 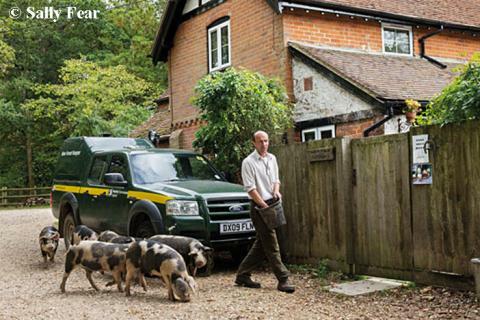 In the New Forest, pigs have always been important, even leaving aside the meat and income they provided. During the Middle Ages, oppressive Forest Laws didn’t only apply to the Commoners and peasants, they also affected their dogs. Large dogs were perceived as a threat to the King’s deer and, as such, were permanently maimed in a process known as “lawing” or “expediting”. 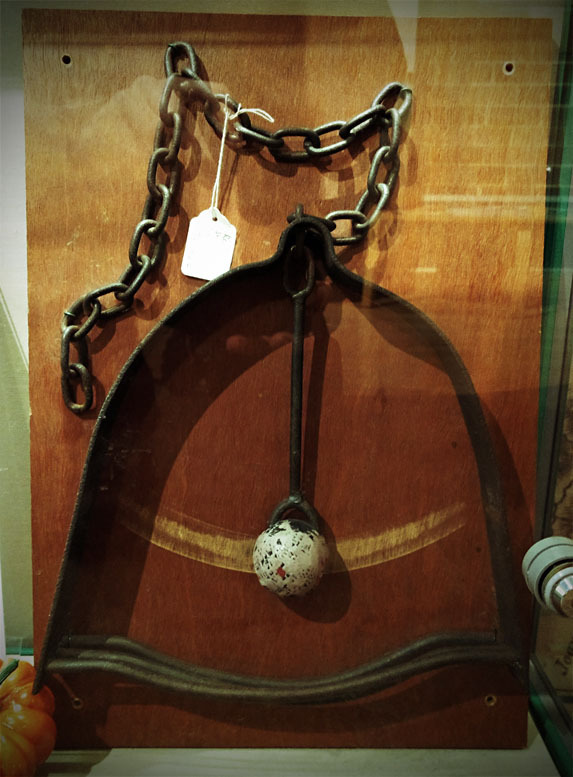 A metal device known as a Rufus (or Crown) Stirrup was employed. If the dog could fit through the stirrup, which most terrier-type dogs (up to about the size of a beagle) probably could, it was considered no threat to the Forest venison. If the dog was too large to fit through the stirrup, it had some of its toes and/or pads removed with a chisel, thereby preventing it being able to hunt deer. As well as being unable to catch deer, small or limping dogs may be less efficient at recovering game, particularly larger birds and hares. It seems that some Forest residents found a rather ingenious solution to this problem, however, and the Reverend William Daniel, in his 1801 Rural Sports volumes, wrote of how some Commoners trained pigs to accompany them on their hunts and recover their shot game. 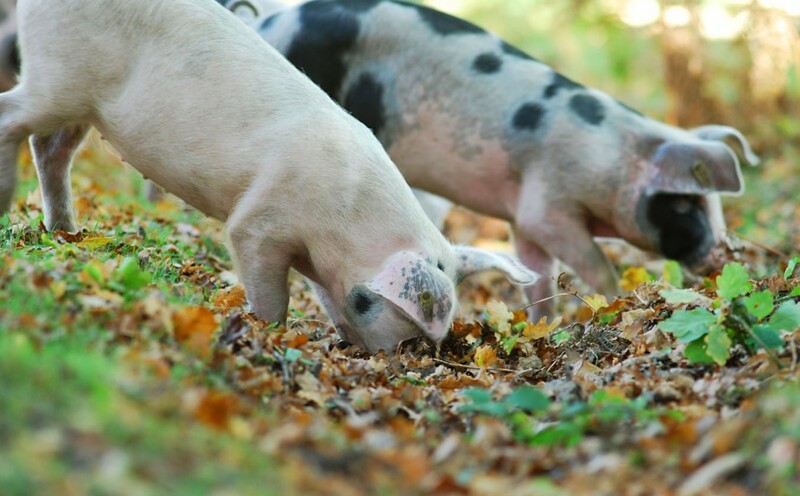 In addition to hoovering up acorns and substituting for man’s best friend, pigs also increase the biological activity on the forest floor. As they feed, they dig with their snouts, a behaviour known as rooting or rootling. Rooting makes the soil more permeable, which improves aeration and speeds up the decay of leaflitter and the release of nutrients back into the soil. As they root, they also trample the ground, and this appears to encourage the growth of seedlings, presumably because it loosens the earth. In Tresswell Woods, Nottinghamshire, pigs were used by the local Wildlife Trust to clear brambles and, according to Duff Hart-Davies in his 2002 Fauna Britannica, their trampling and rootling also resulted in “unparalleled blossoming of bluebells the following spring” and regeneration of the hazel. Pigs don’t only eat nuts and seeds. Being omnivorous, they will readily take other insects and plants as they’re encountered. Hence, insect pest populations can be reduced as the pigs will eat grubs such as cockchafers and click beetles, as well as “opening up” the soil, allowing birds and other insectivores access to the prey. Rooting also digs up and breaks up the root network of some weeds, and pigs have been used to help stop the spread of the invasive American strawberry (Euonymus americanus). 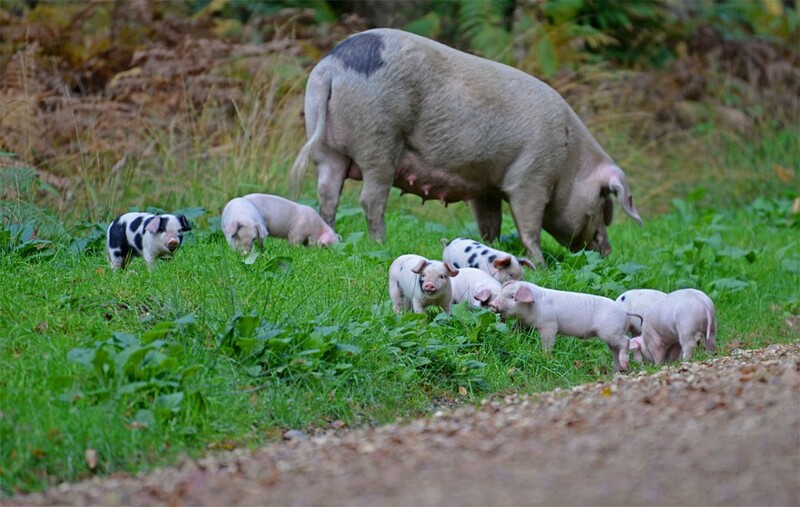 So, next time you’re in the New Forest and see pigs rooting by the roadside, you’ll know they’re the latest in a long line of swine filling an important role in the Forest’s ecosystem.